Not really sure what year this was so we’ll call it 2000. 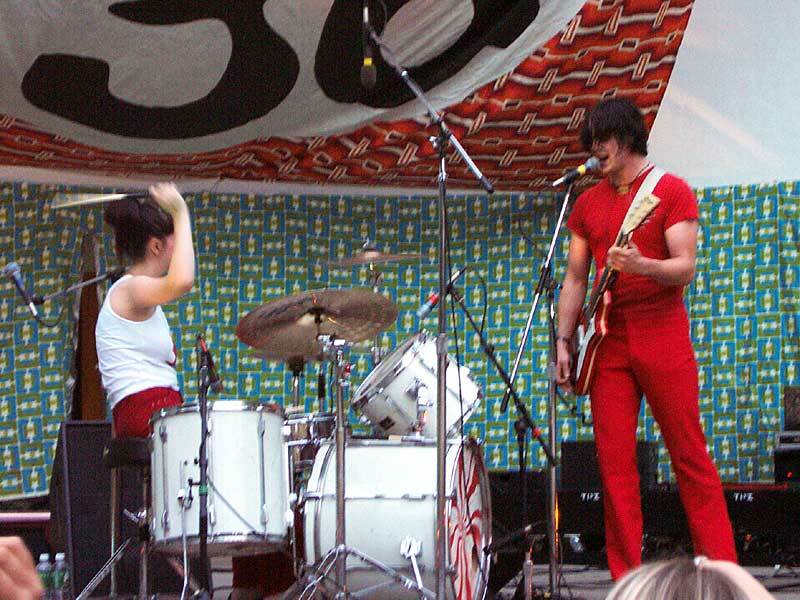 Steve Black was in town and Margaret Explosion was a skeleton crew. Cobbs Hill is the magnetic center of Rochester, New York. Video created by Stephen Black. 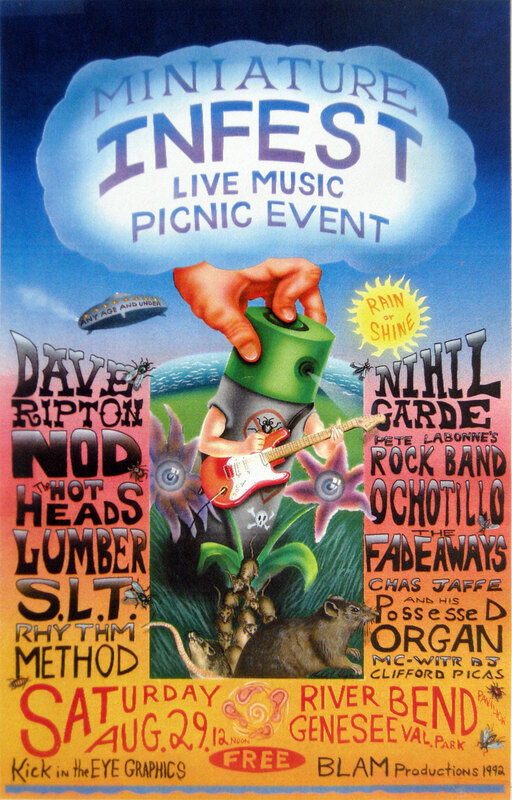 Christopher Schepp poster for Infest 1992. 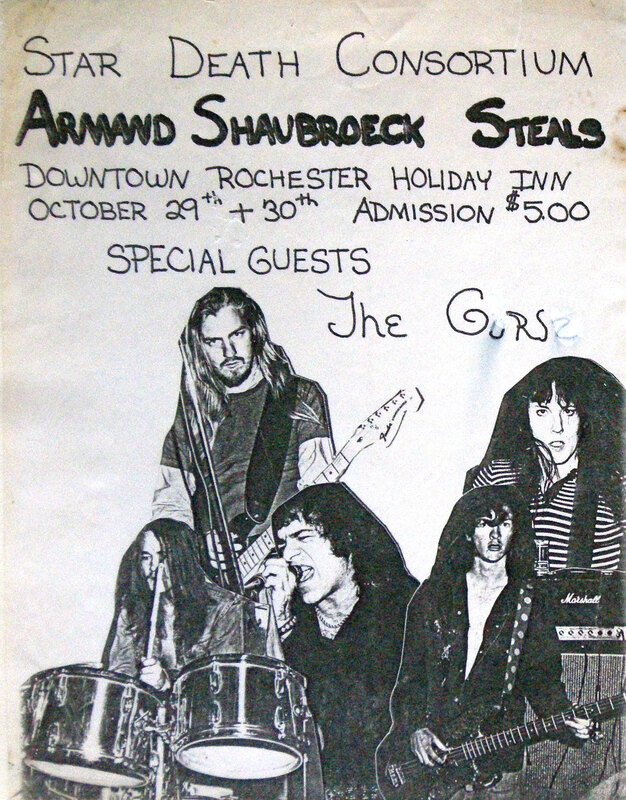 Festival in Rochester, New York included performances by Nod, Dave Ripton, Pete’s Rock Band and S.L.T. 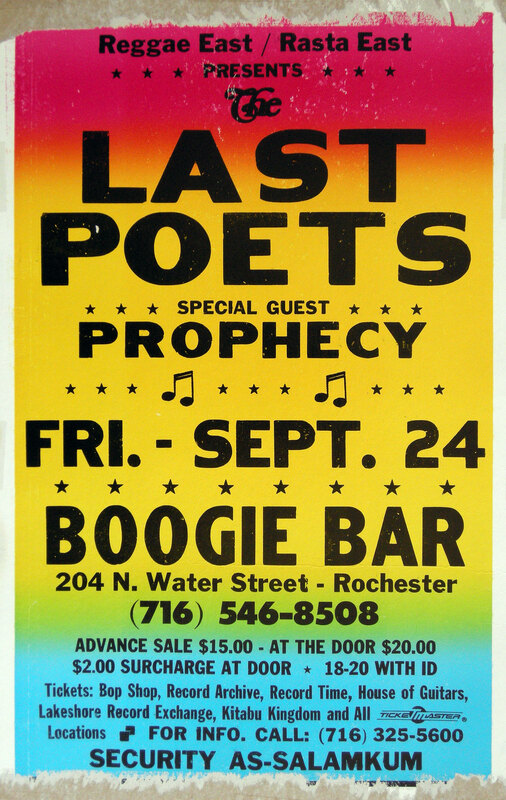 Pete’s Rock Band played only a few gigs and recorded oe casstee for Cheryl Lauro’s Godiva Records. 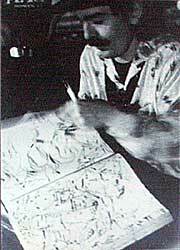 Arpad Sekeres did the production. 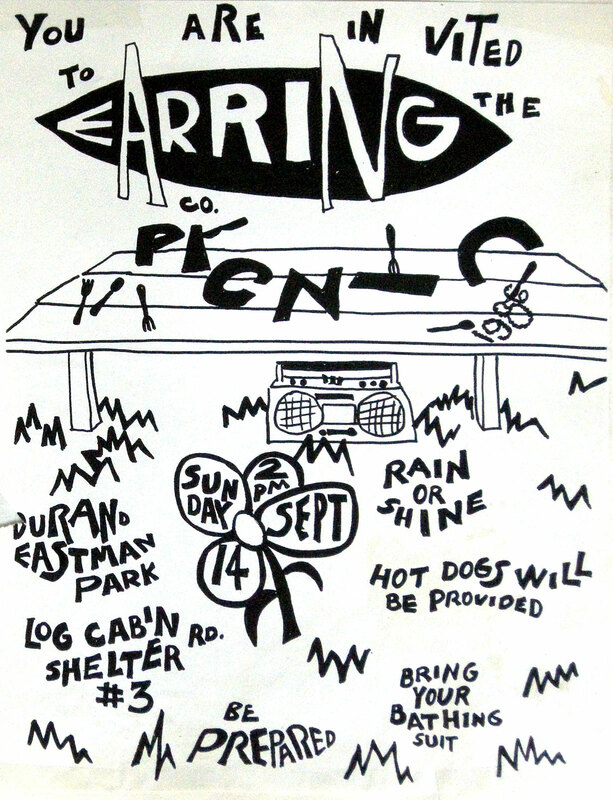 Pete LaBonne played guitar and sang, Bruce Eaton played bass and Paul Dodd played drums. 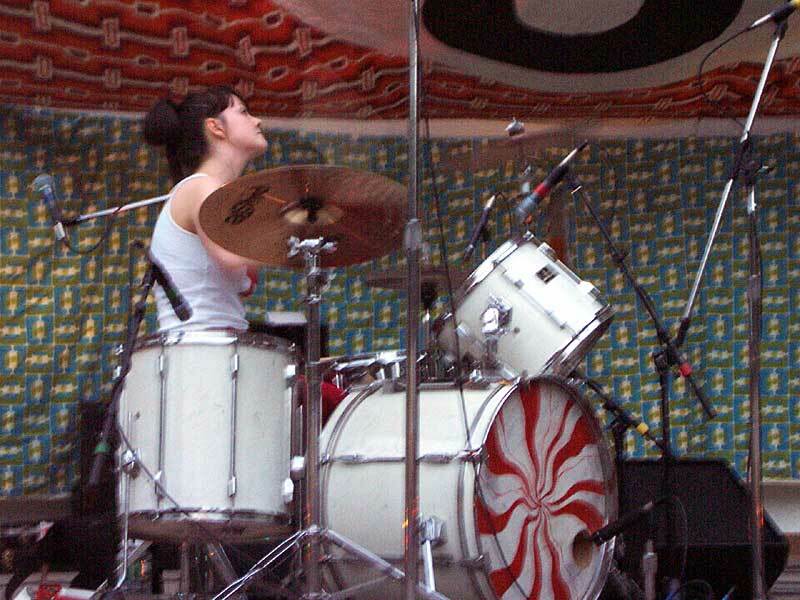 White Stripes – 10th Annual Bug Jar Fest, Highland Bowl, ROCHESTER, NEW YORK August 12, 200. Roadies? We don’t need no stinkin’ roadies. 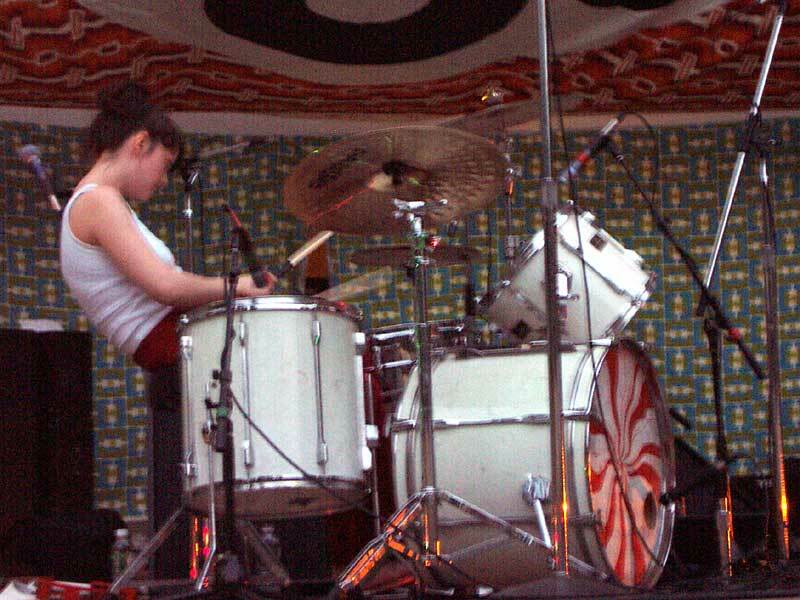 White Stripes set up their own equipment. It was a huge crowd. Where the heck was everybody? Hermie was there. It was casual. Meg was playing barefoot. Those are her white shoes over to the left. And nothing but water for the clear headed Meg. Jack is the star but Meg rocks. Maybe Meg is the star and Jack rocks. They sounded like Led Zeppelin and did great versions of Son House’s John the Revelator and Dolly Parton’s Jolene. 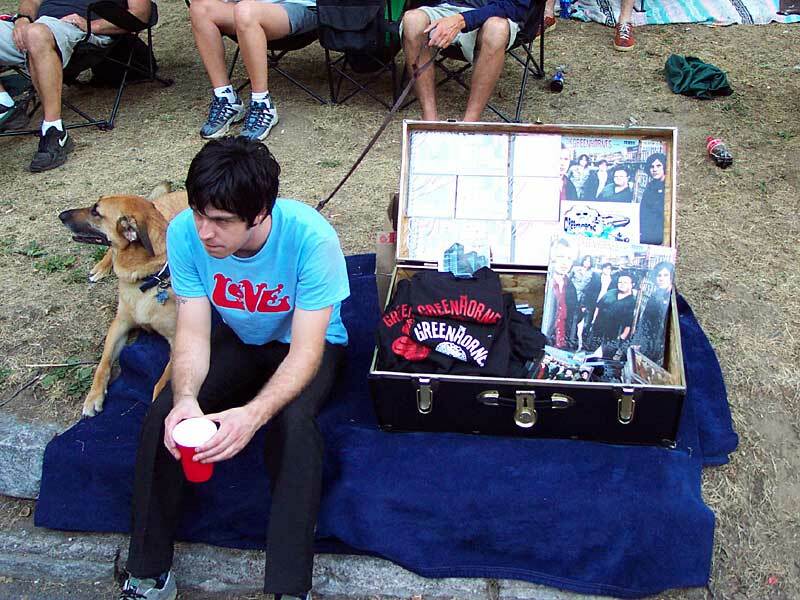 Merch booth for supporting acts. 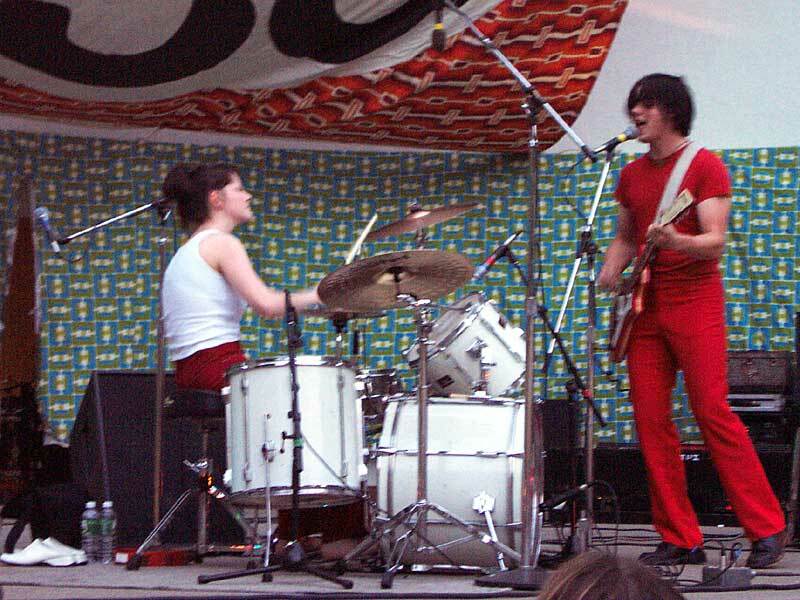 White Stripes – 10th Annual Bug Jar Fest,Highland Bowl August 12, 2001, Rochester, New York. 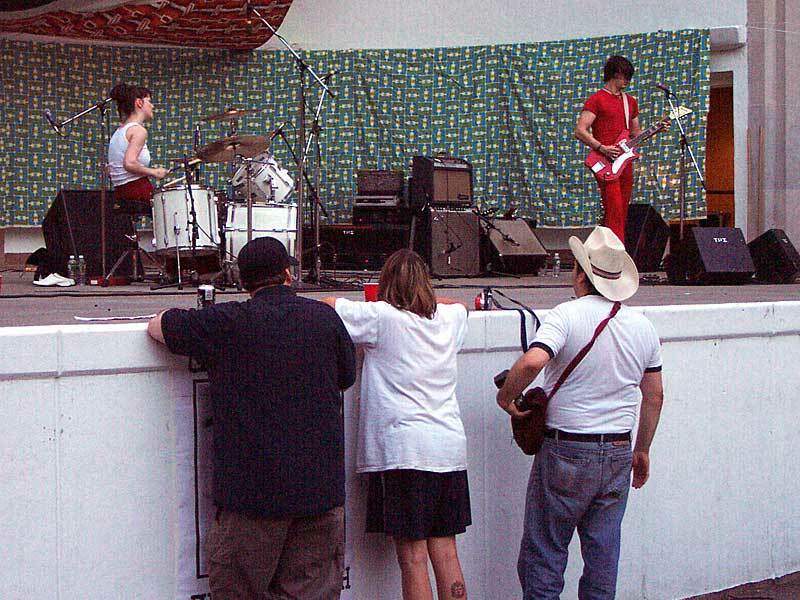 Go Go dancer at 10th Annual Bug Jar Fest, Highland Bowl August 12, 2001, Rochester, New York. Joe Sorriero and David Merulla watch Joe Tunis performing as J+n on Day Tour at railroad tracks near University Avenue. 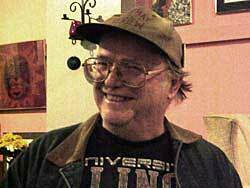 If you frequent Rochester coffee houses where poetry readings occur you have probably heard Norm Davis read. We think he’s great and he’s a wonderful storyteller. For some reason, though, you really have to pull this particular story out of him. It’s almost like he’s embarrassed by it all. But to hear Norm tell it – he is the voice behind Alley OOP, the top forty hit for Kim Fowley’s “Hollywood Argyles.” He was traveling across the country with a bunch of guys and they stopped in Las Vegas where they met someone who paid Norm $50 to sing the song. They were out in California when they heard it on the radio and they almost died. And what is more amazing to my wife is that this single was the first 45 she bought when she was a kid. 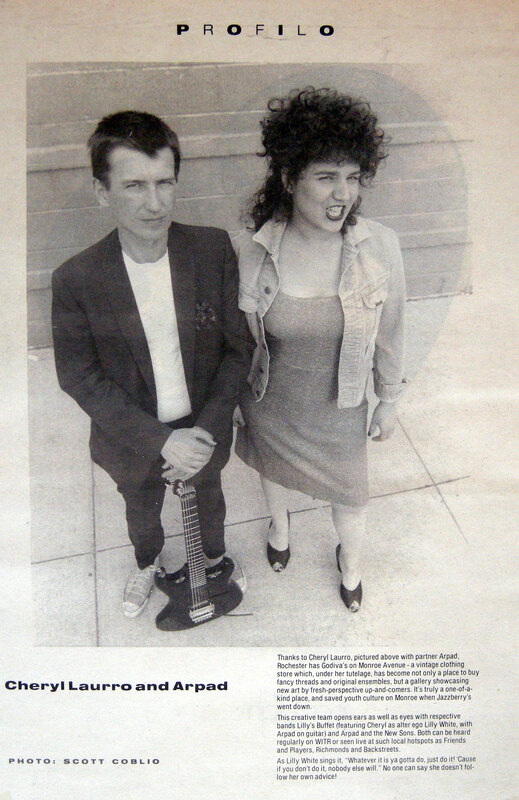 Arpad Sekeres and Cheryl Laurro feature from short-lived Rochester, New York periodical. Yessir, the Little Theatre Café; where time and calories are of no concern or consequence and where mellow is allreet. Wish you could’ve been there. You shoulda seen me; the perfect two-tone, gabardine, patent leather personification of lonely and hopeful. Man, it was tres cool. I strolled in the joint rejected, dejected, determined to wallow in my woe over a cup of joe, to replace lost affection with confection. And dig the tunes. And besides the carnival monkey playing a calliope in my head, jazz has always been my soundtrack.In fact it’s yours too. It’s taken me years to arrive at this, and when I finally did, I felt pretty damn smart. As well, every time I emerge from a movie, I feel somehow smarter. And I find myself (post cinematically, I suppose) wanting to prove it in the Little Theatre Café waxing – reflectively, esoterically while waving a hand that would have a cigarette in it if John Houston directed my life. Then again if he did, maybe the redhead wouldn’t have left. Or maybe she would have simply killed me instead. Perhaps he’d have me sipping espresso as opposed to my usual cup of java with enough sugar to stand a spoon in. I do know one thing…he’d have this music, sho’ ‘nuff. Bring a date, save room for dessert. Spin this disc in the meantime. 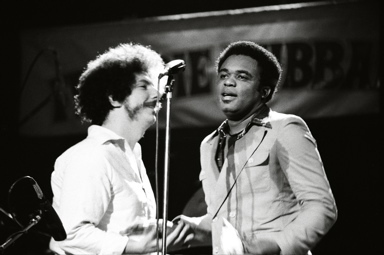 Tom Marcello photo of WHAM DJ Harry Abraham and Freddie Hubbard at the Auditorium Theater in Rochester, New York 1976. 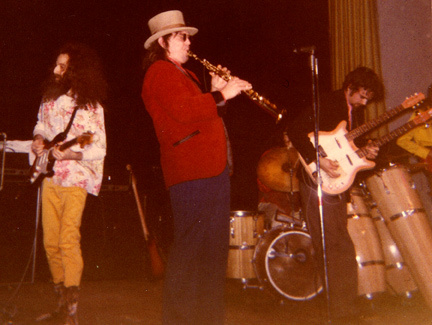 Kevin Yatarola photo of Captain Beefheart performing at Rochester Institute of Technology in 1971. 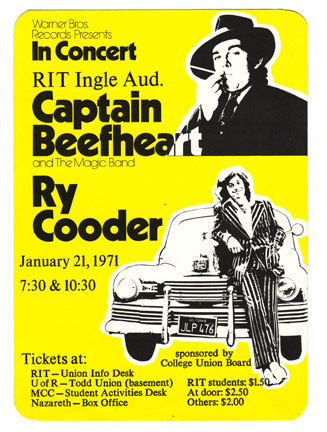 Captain Beefheart flyer for performance at RIT Ingle Auditorium in Rochester, New York with Ry Cooder in 1971.
i wish i was an octopus, i really do though. i mean, could you imagine standing there octapied like that? no, i mean man, that’s beautiful, really…. i love dolphins, and octopuses. 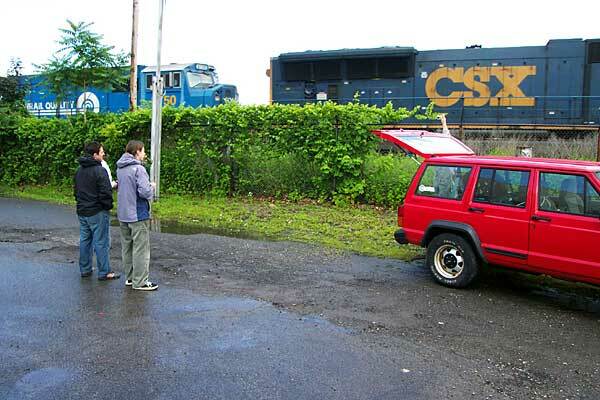 greg (photographing carl and the captain holding a ‘trout mask replica’ album, leaning against a white station wagon): have to stand back a bit further. – snap! – did it work? i thought you said for us to stand back a bit further. i mean, that’s asking a bit too…. impossible…. but no, it is possible to go right through the car: i have done a lot of things like that. no, i mean, i have. the one i just did. the name of it is ‘bat chain puller’, and i’m serious – and that isn’t for publicity reasons – and it is, man, it is góóóód! i got to hear every little note. i wrote every little note – of course, i always have – but i got every little note right on the tape. (in the background friends were whistling for their dog to stay out of the kitchen) – let him go. please let him go. no, what is it? bella lugosi – no: boris – ummm, bella lugosi: ‘tonight we fly’ (waving a pointed finger toward the sky). no, he looked like that, played a theremin and was an apprentice of dr. theramin [the russian inventor of that instrument – t.t.]. and i wrote it on a blackboard and he played it note for note. i mean, i wrote it advanced music – and he played it note for note. i am talking about shapes: he did it note for note, and he didn’t miss what i thought. i mean, he was fantastic. i was a sculptor, a child prodigy sculptor. when i was 13, i had a scholarship to europe from ‘nuitsence creamery’ (or so – editors), and then my folks moved me to muhabbi (or so – editors; what about: mojave? – t.t.) near the high desert, where they put the oriental people during world war two, which was real sick. so here i was in mojave, a marine base, no, an air force base; i mean, in order to keep my mind the way it is, they didn’t like my eyes you see, so i had to defend myself. i mean: i had to every day. five people at a time. i mean, all you can do when people jump you like that is punch your way out – i mean, who would want to punch out? but if you don’t punch, you get poked. and i never got poked. that was terrible, leaving that art area in los angeles. i used to go to the park zoo, i knew all the animals, sculpted all the animals, they were all friends of mine, and that’s about what all i knew were animals, and then bóom! : here i am in mojave. my folks moved there, i couldn’t get away. i ran away many times. i never went to school in my whole life. if you want to be a different fish, you’ve got to jump out of the school. i don’t. i mean: i don’t. i have one that suits me just fine. 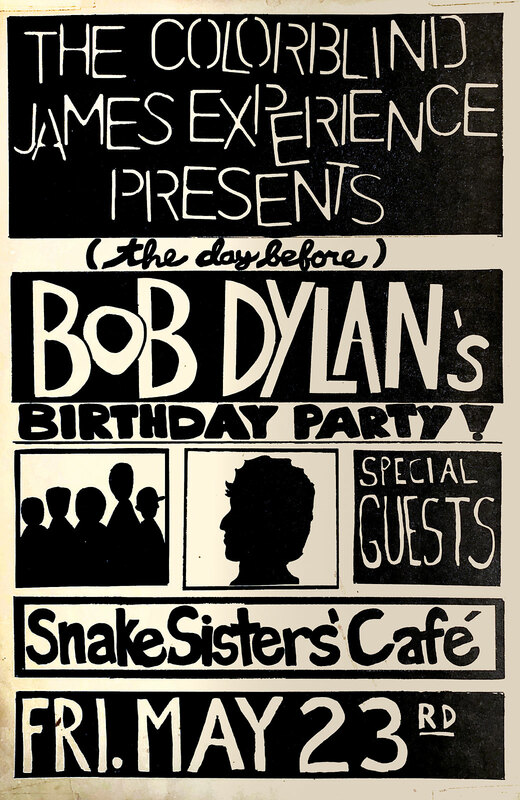 i’ll tell you who has been on this tour with me – and i wished he was here tonight. 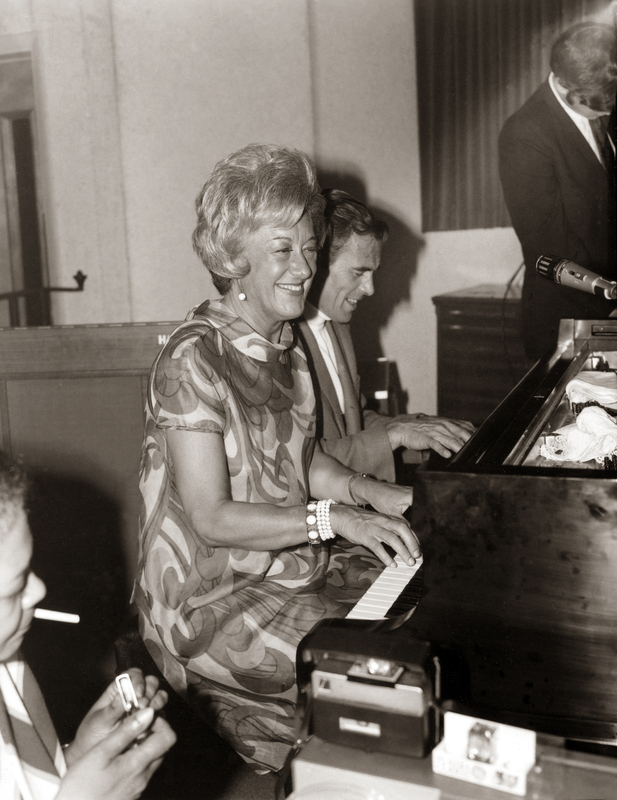 his name is sunnyland slim, a black blues pianist. the most fantastic. listen, i thought i had heard it all, but man, i hadn’t even begun. this fellow is a genius. there’s no doubt about it. i mean, this man is brilliant. brilliant. brilliant. i mean: brilliant. 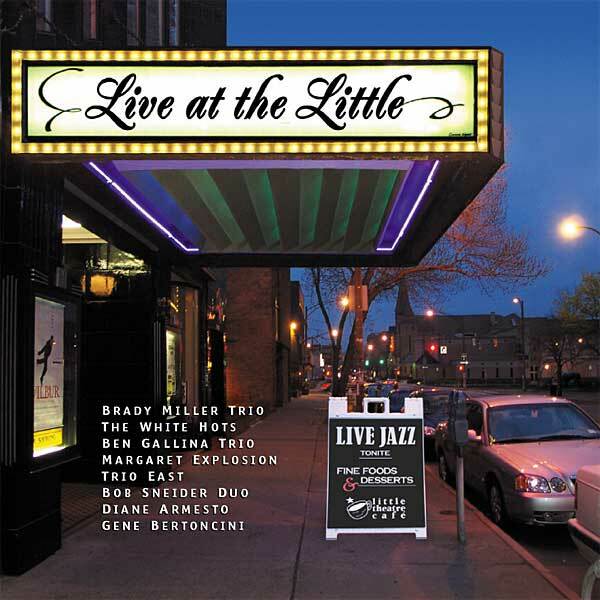 just a grand piano, and a drummer, and man he did ‘tin pan alley’ for me the other night and i was crying my eyes out. i almost fell off, in buffalo. 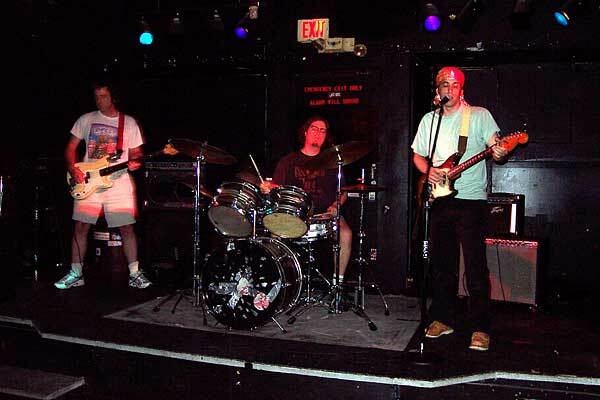 i was standing there, and denny walley, our slide guitar player saved me, because i was falling backwards – like that, man (captain demonstrates) – and he saved me. i was falling down a hell of a flight of cement stairs. i mean he just took me. i swear i was off the ground, i think he did levitate me. i mean, i mean that. you’ve got to hear him, man. and he is the best i have ever played with, and i have played with a lot of them. he is the best i’ve ever played with. i wrote ‘lick your labels off, baby’, and i’m having a little trouble getting back on a label, because they know i believe in it. but we’re in negotiation with several companies: epic, capitol…. one, two, three, four, fíve days! and i gave them six yéars! they gave me five days with their audience, and with their fans as well as my fans. in europe, england, everywhere, holland, switzerland, germany, america – a tour, a big tour, and they gave me five days to get a group together to do my music. 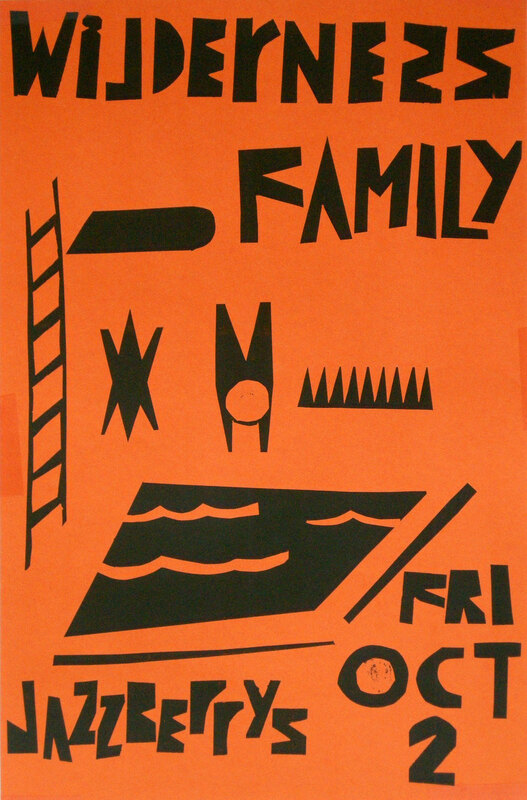 that’s what you get: ‘tonight we fly’ (once again pointing a finger toward the sky). but thís group! i have looked for this group for twelve years! we all love animals, the whole group, complete consciousness, we know that the largest living mammal is the absent mind…. i’ve been getting these record negotiations out of the way, so i will be completely clear for publishing books and things like that. i mean, i really have a lot of novels, and a lot of poetry. it will be. as soon as the end of this negotional things that’s on going. i have exhibits of paintings available now if you have a plane ticket. they’re back there (california – editors). i would like to do an exhibit in new york. this concluded the interview with the captain. 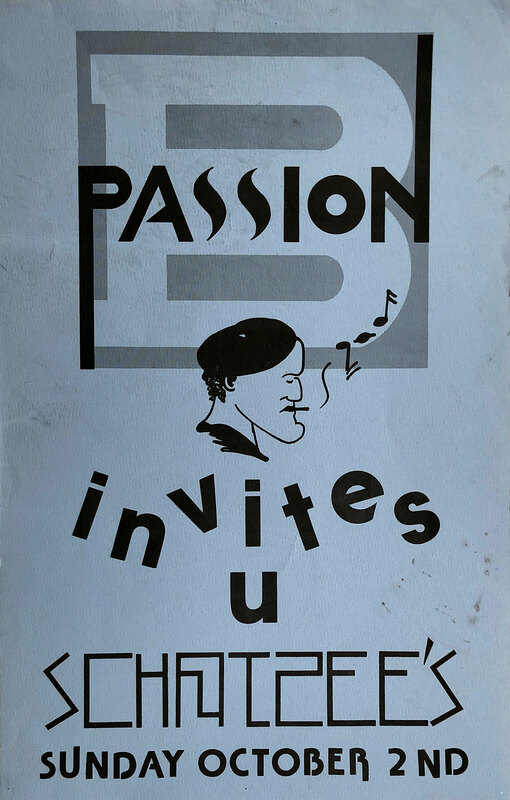 the band (captain – sax, lead vocal, harmonica; robert williams – percussion, drums; jeff morris tepper – guitar; denny walley – slide guitar; eric ‘black jewel kittaboo’ feldman – bass, keyboards, synthesizers) went on to do the 10:00 performance to a packed house. they played cuts from the new album and various classics from the captain’s earlier works. 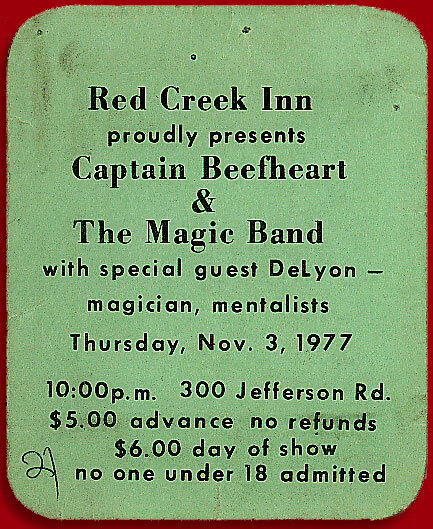 the band performed with amazing accuracy and enthusiasm along with the captain’s inimitable, charismatic personality.